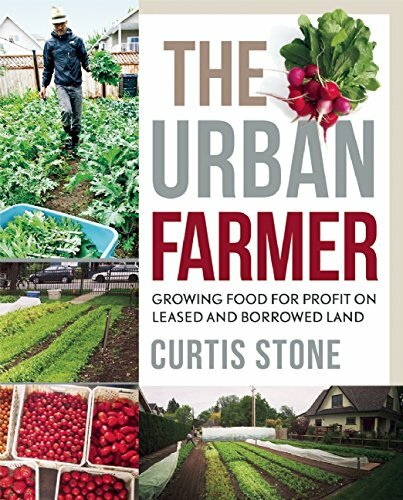 If you are seriously contemplating a full-time career or even a side business in yardfarming, Curtis Stone’s upcoming book, The Urban Farmer, is definitely the place to start. As he tells the story, Stone was an unlikely farmer. He recounts his various jobs as an aspiring rock ‘n’ roll musician, tree planter, and screen printer. But then after a life-changing biking adventure down the coast of California, he decided to live a life that addressed the rampant environmental degradation and other geopolitical issues he cared about. Stone’s philosophy is not unlike that of Yardfarmers: with all of the unsustainable lawns and yard spaces in suburban and urban neighborhoods, why not turn these wasted 40 million acres into a series of farming ventures and provide fresh, healthy food for the local communities? This is the model that Stone implemented in his own farming practice. In my first season of farming, I learned a valuable lesson within the first three months, and I want to instill it into you, the reader. Don’t take on too much right away! Start with ¼ acre or less! He learned the hard way that it was easy to overextend yourself in the beginning when you are so excited to get started and make a difference in your community. Low startup costs are not the only advantage of yardfarming. Another unique aspect is the fact that you will be much closer to people (your neighbors and potential customers). When you farm in a neighborhood, you are much more visible than if you were on a farm on the outside of town, and you will almost certainly have questions from curious passersby, which is how Stone received so many offers to farm additional plots when he was first starting out. This is an opportunity to educate them about what you are doing and why, in addition to telling them where they can purchase produce from you or how to sign up for a community-supported agriculture (CSA) membership you may have. Opportunities to educate and interact with your neighbors and potential customers are invaluable and could also help spread the yardfarming revolution! Along with low startup costs and nearness to people, another major advantage is that markets are also close by. Your produce can be sold at farmers’ markets and restaurants in the city. It is much more lucrative and time-saving to be able to transport your produce a few miles to a market or restaurant than shipping it from a rural area outside of the city. Stone discusses the cost and location benefits to urban farming in the beginning of his book, but then quickly gets down to logistics and lays out how to set up your own urban farming business. With details about how to set up your gardens, what to plant, when to plant and harvest, this book will help you get your own yardfarming business up and running. You can make a living doing something you love and feeding your local community fresh, healthy fruit and vegetables at the same time. To get an income stream as quickly as possible, it is best to start your growing season with crops that mature quickly, so you can get them to market as soon as possible. Some examples of these are radishes and spinach, which mature in 28 and 45 days, respectively. After this consideration, it is good to plant vegetables that fetch a good price, and in turn will cover the costs of your business and leave you with plenty of cash left over. This is especially true if you want to make urban farming your main source of income rather than just a side business, as Stone did. Some crops that have a high price per pound are microgreens and various types of kale. 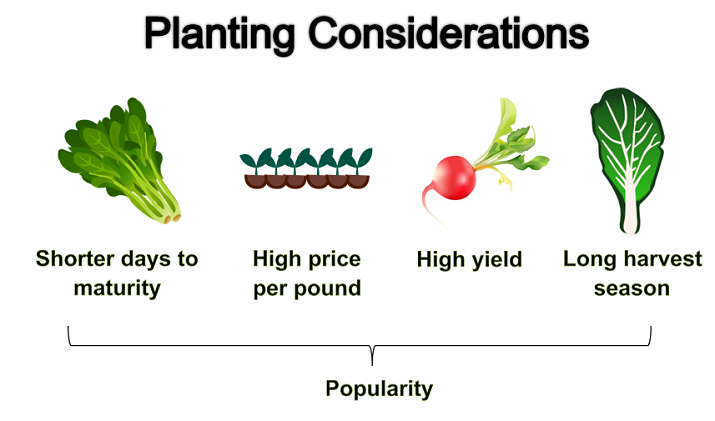 Using yield as a planting consideration goes along with the price per pound criterion. The more vegetables you can grow on your plots, the more you can sell. Take cabbages and radishes for example. In the same amount of space it takes to grow one cabbage you would be able to harvest eight bunches of radishes. Having a long harvest period can mean either that your veggies can grow and regrow through most months of the year like spinach and kale, or that they have a long harvesting window. Popularity is fairly self-explanatory. If no one likes the veggies you grow, none of the other considerations really matter. Stone also discusses selling considerations like dealing with restaurants, working with chefs, setting up your own CSA, and selling at farmers’ markets. Beyond this he discusses the business side of running your own farming venture, including tips on staying organized and using spreadsheets. He even lays out the details of how to choose and survey properties to grow on, and how to approach the land owners to discuss leasing their land. Stone gives you the knowledge from his years of experience building his own urban farming business—knowledge, if read by new yardfarmers, will surely save many a misstep along the way. About the Author – Emily Helminen is a fellow for the Transforming Cultures project at the Worldwatch Institute. With a background in biology, engineering and philosophy, Emily has followed an unlikely path to pursue a career in environmental sustainability, but it is the field in which she hopes to truly make a difference. Having been a farm owner with hundreds of acres one acre seems so small until you get out there with a hoe in August. While I have plenty of land this year my garden is in my front yard. Any place else the deer devourer everything. It is easy to over plant in zeal of anticipation for the new year. Unless you are very healthy or have good help 1/4 acre is probably too much. When I’m able to afford a good deer fence I will go back to my large garden. I don’t plan to sell anything I want to see how self sufficient I can be.